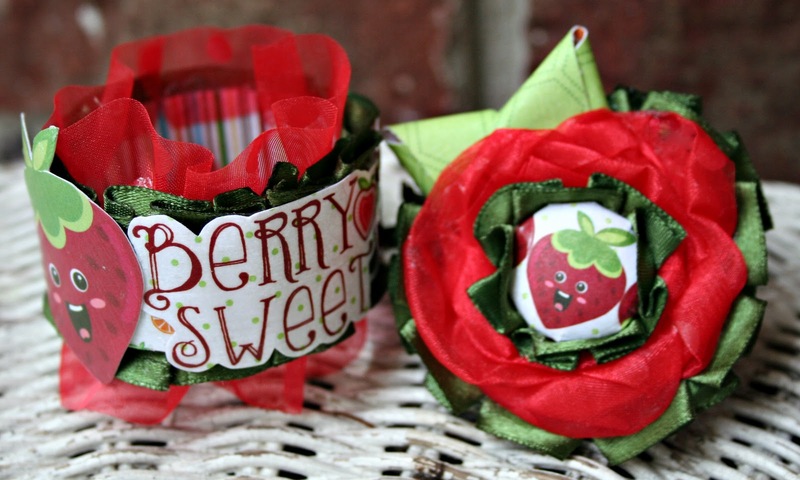 I'm back again to reveal some fun little projects I made with the new Imaginisce Berrylicious line. The second I saw this paper I new exactly what I would do with it. Did you see the layout I did yesterday, which included Reese in the adorable little strawberry outfit? I had just bought that outfit when Berrylicious arrived on my door step and I knew it would make THE best accessories for her little outfit. 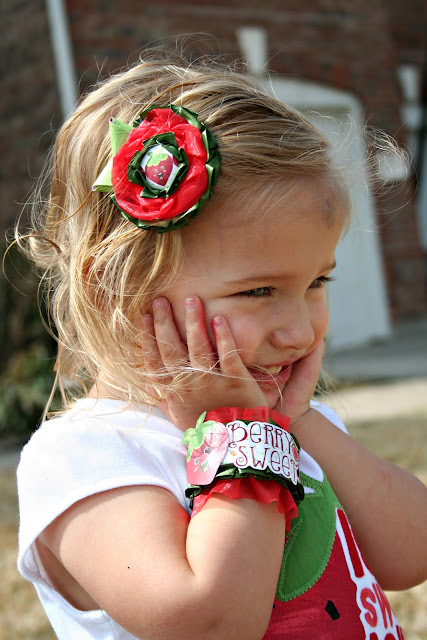 I made this "Berry Sweet" bracelet and hair clippy. For the bracelet I used the chipboard circle that is leftover from the roll of glue dots. I cut strips of paper for the outside and inside. I mod podged the outer strip on and then adhered some ruffled ribbon around both edges. I put the inner strip on over the inside ribbon seams and then it was time to decorate it. I fussy cut an assortment of strawberries and the Berry Sweet saying. I mod podged them to protect them and make them a little sturdier. I really like how it turned out. For the hair clip, I cut a circle about 1.5" diameter, then twisted red dotted ribbon around it adhering with fabri-tac. I made leaves by folding over the green strip from the Sweet Summer Garden paper and adhered them to the circle. After that I pulled out a Imaginisce Twist Alligator Clip and a Medium Twist brad and covered it with the Berry Patchy line. I trimmed the outer edge of the twist brad and red ribbon circle with green ruffle ribbon. 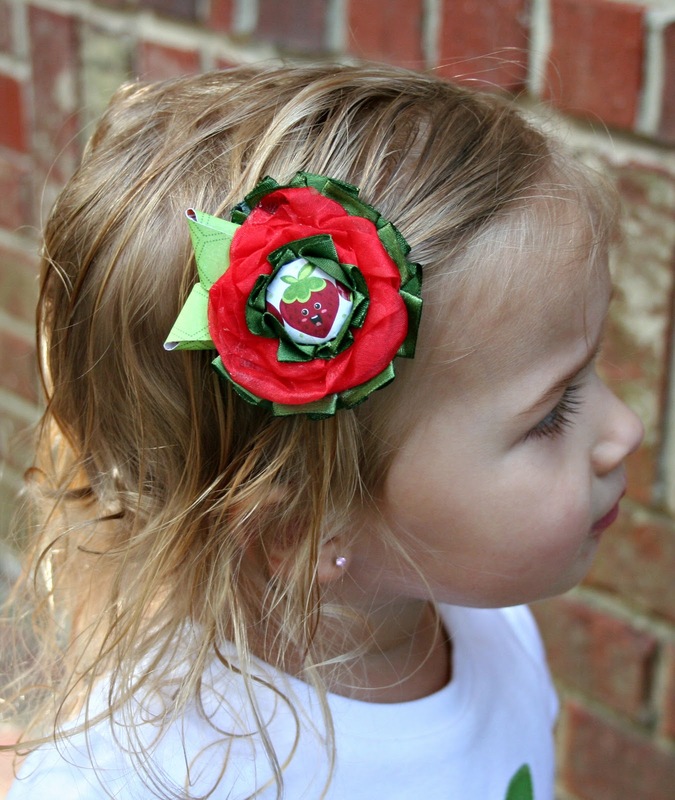 Lastly, I punched out the middle of the red ribbon circle and instered that little twisty strawberry brad in and voila I had an adorable alligator clip for my daughter's new outfit. 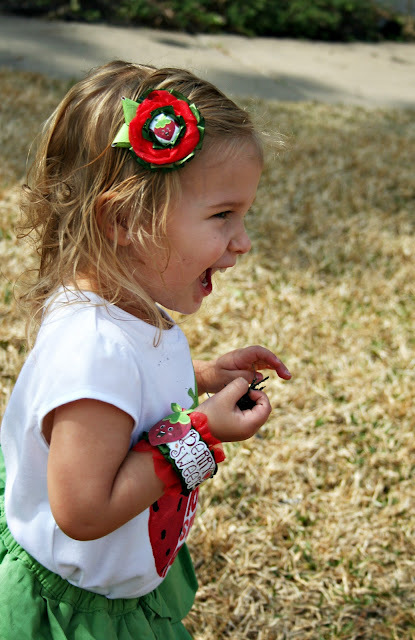 Here's some pics of Reese all decked out in her Berrylicious accessories. Isn't she the "berry sweetest"??? Still here? Make sure to check out the blog at Imaginisce to see how you could win the entire Berrylicious collection! How cute are these! What great ideas and it looks like your daughter loves them!!! Well hello AMAZING! And I love the photos of the pretty little girlie!! Love this!! I love the red that you added and the clip came out adorable!!! SOO fantastic! 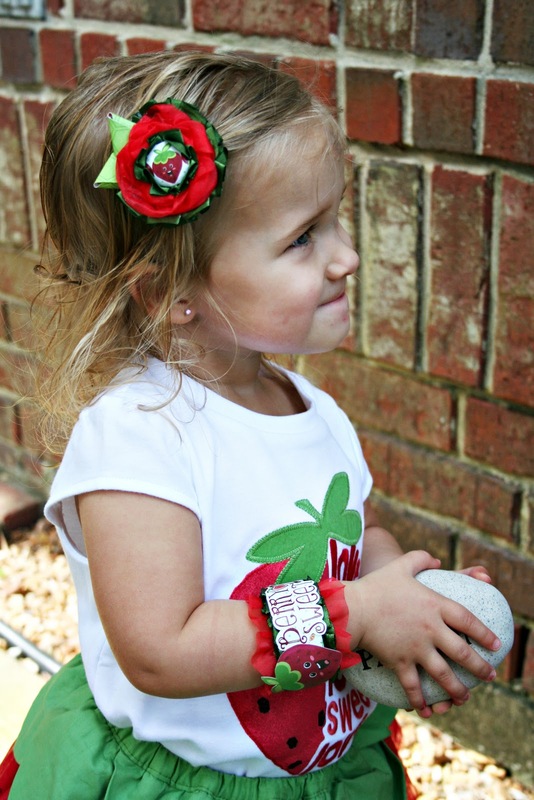 my goodness these pictures are CUTE, LOVE that she can wear your art! Really? This is the Best Photo You Got?